Recently, Techno Q has become the second AV enterprise from the Middle East region to be honoured with the prestigious ‘AV Provider of Excellence’ (APEx) by the InfoComm International. The designation of APEx recognition is taken as a big credential of professional excellence in the fieldof audio-visual and systems integration business. APEx is InfoComm’s seal of approval for companies that set high standards for employee training and certification and meet their clients’ needs by delivering exceptional solutions. With this mark of distinction, Techno Q joins an elite group of about 51 dedicated integration companies and AV design consulting firms worldwide. General Requirements for Bodies Operating Certifi cation Schemes of Persons programme. 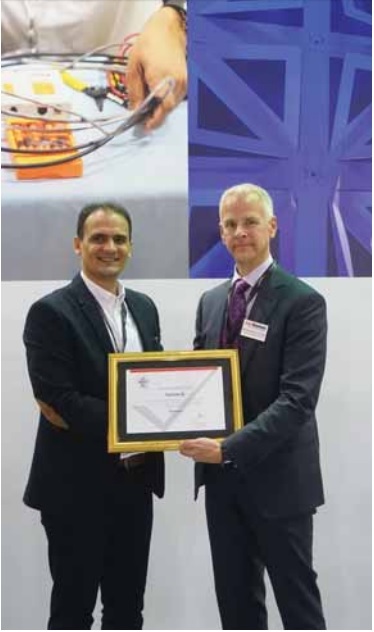 The Award was presented to Maged Amin, Head of Design Audio-Visual, Techno Q by InfoComm International’s Executive Director and Chief Executive Officer David Labuskes at a special programme during the InfoComm Middle East & Africa 2016 tradeshow in Dubai. Techno Q getting the recognition indicates the company’s commitment to excelling in best practices in the field of audio visual systems integration, commended the InfoComm CEO. Being a leader in the region, and for the quality standards it set for itself, Techno Q deserved to be honoured, he commented.